Specializing in Rcandy: KNO3/Sucrose propellant made by solution and recrystallization. New to rocketry? Returning to rocketry? Check out the Fly Rockets website! What this site is about: Nourshing the spirit through learning, thinking, and discovery. Flights of fact and of fancy. Extraordinary achievements using ordinary things. Making ROCKETS! What this site is NOT about: Bombs, weapons, crime, hate, and fear. If you have intent to harm persons or property, to flout the law, or even to frighten others, you may NOT use my methods! Essential to the method is an attitude of care and profound respect for others, their persons, their property, and their peace of mind. 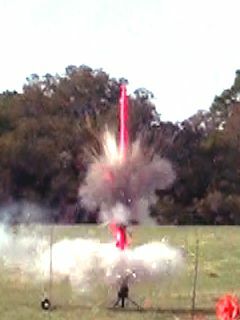 Rocketry is inherently dangerous. To do it, we must adopt the highest of ethical standards and practice them faithfully. It's a dog-eat-dog world.... so don't be a dog! This site is NOT about fireworks either, although I love them too. The laws and rules for fireworks are different than those for rocketry. To avoid excess confusion I will present here only those techniques that are relevant to rocketry. This may not be readily apparent, as some of the same techniques are used in both venues. Monoblogue - Can't get enough of my verbiage? There are therapies, you know... But until you find the right medication, here is more. Answers to questions I have received in e-mails over the last couple of years. I could go on and on... and I do! Leaders in Sugar Rocketry - a collection of links to sites of other researchers working with this propellant. Please read their SAFETY pages as well as mine! I recommend reading each and every one of these sites before commencing any rocketry experiments. This is one area where ignorance is NOT bliss. It can be a blast, and not necessarily the fun kind.
. If it makes you go "WOW!" it can also make you go "OW!" I found and scanned one of my notebooks from the previous century. Pretty boring, mostly, but there for posterity. It includes one of my earliest formal descriptions of the rcandy procedure. Next in the series, August 1980 until February 1981. This one is a lot longer... I finally got some C and D-class motors to work occasionally. By the end of the book the motors were working fairly reliably, and I had my first shipment of pyrotechnic chemicals to play with. Colored stars! I was in pyro heaven. Videos illustrating the conversion of test stand data to an Excel spreadsheet which analyzes motor performance. USLI Launch, April 2010. Huntsville. Nice photos of Marshall Space Flight Center. I got video of each launch. USLI Launch, April 2011. Only a couple of videos out there, my team launched early, so we left early to start the long drive home. Successful, though! The UF team I mentor placed 10th in a field of about 30 schools. Dire Warning! .... Is now abated...somewhat. Two students from University of South Florida were arrested in August 2007 for transporting sugar propellant rocket motors across state lines. One of them went to prison... for something else. The other was acquitted - found "not guilty" because he did not make the rocket motors, nor did he have any knowledge of them. Fortunately for him. Unfortunately for us as the court decision thus had no influence on the legality of sugar propellant. Activities shown on these pages may not be legal in your area. Please check out the Federal, state, and local laws before engaging in rocketry activities! So now that the case has been resolved, I feel safe in releasing my "court documents." They are videos and other documentation used to demonstrate that these PVC sugar motors are not "pipe bombs." Click here to visit the AIR website I am very proud of my rocketry friends Steinn, Smeyr, and Magnus, who successfully launched their KNO3/sucrose rocket in November 2006. 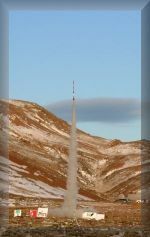 As far as we know, this is the first amateur rocket launched in Iceland. Safety First - if you are going to make this propellant, you MUST read this page and heed its instructions to stay well, stay whole, and stay out of trouble. Even that may not save you, but it's a start. No Karo? No Problem! Alternatives to corn syrup. A little dextrose and fructose works well. Glucose syrup is reported to be OK.
Smokeless ejection II - "static tests" using Red Dot in a real airframe with parachute. Worked well. August 2005 - Two flights of the Sugar Rush. First one straight as an arrow with BATES grains. The second using a moonburner grain, wags its tail upon liftoff so severely as to cause early ejection at motor burnout. Also Ti night launch. Delay grain failure made for a spectacular photo, and a very low flight. November 2005 - Big Sugar Launch 2. Due to "operator error" my video camera did not catch the flight. But others contributed their photos and movies to make for a pretty good show. Motor and airframe worked well. Nothing else did. February 2006 - The Sugar Rush gets to fly with its new nose cone and blows it. Not the nose cone, the fin department. Motor casing is overpressurized and blows out the head end closure. But that was a good thing! Really! March 2006 - Rebuilt the lower section of the Sugar Rush, obtained a new Loki 4-grain 54mm motor, and am ready to fly again. 3 good flights, paper nose cone works fine. April 2006 - Jonathan Carter was here for a few wonderful days. We went to the NEFAR launch, where he fired his Like a Woman Scorned airframe using his own K-motor burning KN/dextrose. An impressive flight. I had reconfigured the Sugar Rush for dual deployment again. Fired once using the 4-grain 54mm Loki motor and Pixy Stix propellant. Sims put apogee at 5100 feet, altimeter said 2510 feet. Quite a discrepancy there. Check out the video and judge for yourself. July 2006 - Maiden flight of the Pixy Stix Drifter, a project started by Pete and Dennis, and donated "to a good home." Don't know about the good home part of it, but she finally flew! Sugar Rush flies again on 5-grain motor. 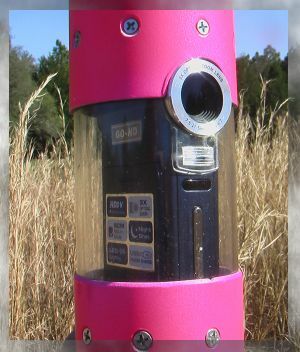 August 2006 - Video of Steve and Rick's camera rocket. Sugar Rush flown on propellant load made by UCF engineering students in our workshops back in July. Their motor load worked great! My recovery system did not work so great.... The cows know where it is, but they are not talking. October 2006 - No web page yet, just a link to the 9-meg launch movie. Pixy Stix rocket launched with 4-grain Loki motor using 3 grains for propellant and one for smoke. Apparently smoke grain broke in half and burned as propellant, as acceleration and altitude were greater than simmed, and there was no trailing smoke. Rocketry Organization of South Carolina (ROSCO) ICBM launch at Orangeburg, March 31/April 1, 2007. An outstanding launch with lots of sugar being flown. Here is my video collection. April 2007 NEFAR launch. Fired the Sugar Rush once with handicam. Several other launches documented. July 2007 - NEFAR launch. I blew in from the West just as a huge thunderstorm system was coming in from the East and everyone was frantically tearing down, putting away and driving off. Thus I captured no flight video. But some members got there on time and flew in the morning. I've uploaded a few of their videos to the NEFAR website. August 2007 - I flew the Sugar Rush once, this time using the propellant load we made in the Thunderflame course back in July. It worked great! You know, AP isn't all that bad... There are lots of other interesting launches on this page as well. September 2007 - One more flight of Sugar Rush with Aiptek camera, this time on a Loki 2000 casing, sparky sugar moonburner. Again many more launches. Sugar Rush is #43 of the 53 I caught on tape. October 2007 - Another fine NEFAR launch. I get so excited capturing video of other folks' launches that I don't do many myself. But I did get in another flight of the Sugar Rush with camcorder onboard. The humidity had dropped below the usual 90 percent, resulting in a clear day and perhaps the best video so far. It is launch #63, way down on the page. Bunnell Blast - November 2007. I caught video of many launches, including several nice sugar motors by Scott Jolley, Marc Slabbinck, and Steve Ghioto. Sugar Rush was launched twice. Camera glitch during first launch resulted in bad file, thus no onboard video. Second launch obtained good video, but not quite as pretty as the October launch. January 2008 I did a silly thing at the NEFAR launch, sending up TWO long rockets at once. Both are male, both are pink, so this is a real Drag Race! Both had cameras running, one of them high definition. February 2008 - NEFAR launch. Tried the silly drag queen drag race again but made a silly mistake. Used a hardware-store washer for the nozzle support ring. BAD IDEA. See the results at the NEFAR web pages. April 2008 - NEFAR launch. Fired the Sugar Rush using a Gorilla sparky demo motor, and you know, it worked pretty darned well! June 2008 - NEFAR launch. No launches by me, I just documented everybody else's launch and had a lot of fun doing it. July 2008A - NEFAR launch. I'm still laying low, taking video and doing edits. January 2009 - Sentinel Launch Flew the Sugar Rush on a 5-grain 54mm this time, to give the Sugar Shot electronics a little more challenge. 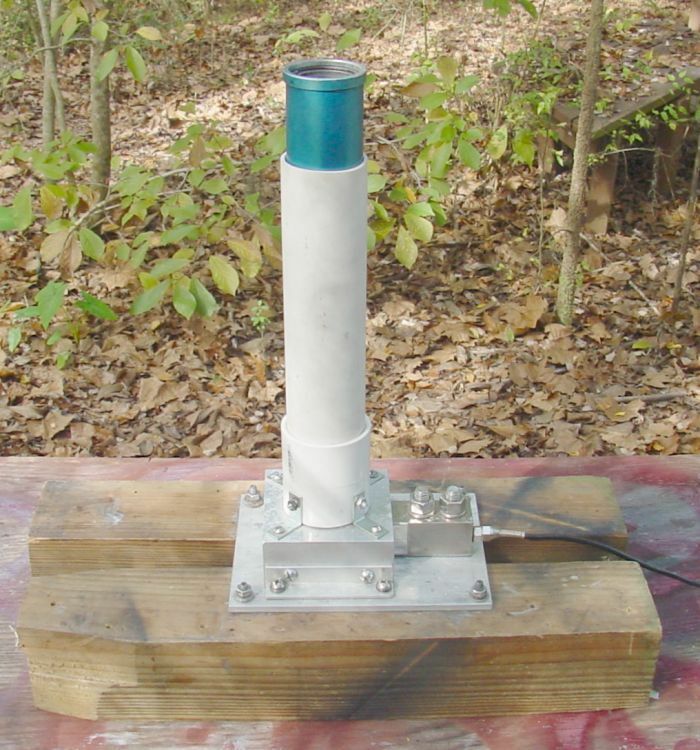 February 2009 -Sentinel Launch - We had a propellant-making workshop at North Florida Community College, hosted by Terry Zimmerman, Chair of their Physical Sciences department. Several groups of students each made a small batch of propellant, and packed one 54mm grain. These were assembled into the motor which flew in the Big Bird at this launch. It may look like I've stopped doing videos of the NEFAR launches. NOT! I do them almost every month. But since I now maintain the NEFAR website, I've started putting NEFAR launch videos on that site. It seems reasonable, don't you think? To see those launches, go to the NEFAR video gallery. Pictures of the Loki motor to illustrate how the snap-ring motor casing works. Includes a few photos of the Dr. Rocket 38mm for comparison. A few photos of the Loki head end closure with smoke grain recess. Sealing the load - sugar propellant keeps very well IF you can keep out all the moisture! For flights using the Loki motor (and others! ), see NEFAR launches above. 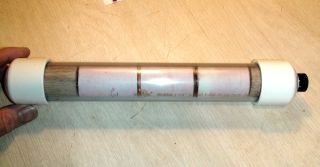 Motors - Detailed instructions on making 18mm single-use motors using rcandy, posterboard, clay and glue. A minimum of tooling is required, the only items one might not find in a hardware store are KNO3 and Bentonite clay. Ramming-Tool - Illustrates the construction of the spindle and rammer that makes the nozzle for a model-rocket motor. This is the method illustrated in the model rocket movies, and considerably more efficient than the pack-and-drill method shown in the web pages. 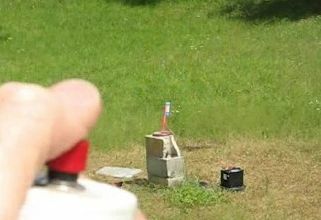 These videos provide an in-depth demonstration of the making of model rocket motors. Annoying narration, funny-looking actor, and way too long, but it covers almost every aspect of making rcandy model rocket motors from scratch - propellant, tubes, nozzles, assembly, ignitors and more. Due to bandwidth restrictions, I have divided the movie into 9 smaller vignettes and moved them to a different site. Please download these to your computer rather than viewing repeatedly from the web - this will reduce demands on the server and help keep the geeks off my back. As a side benefit, they will probably play more smoothly running off your hard drive than streaming off the web, even if you have fast access. CD Saucer - a small flying-saucer type airframe that uses an old CD or DVD as the base disk. These fly well on 18mm model rocket motors, either commercial or homemade. A plan for getting Level 1 and Level 2 certifications. Mounting altimeter standoffs - an easy method of getting them in exactly the right spots. Aluminum Micro-Motor: Nozzle cast directly into aluminum tubing. How To... a summary of the technique - minimum of rambling narrative. Micro Rockets II - Whizzers! VTOL rotary rockets! Tiny Turbillions! 3 gram rockets that fly 400 feet! Less is more! Historical pages - Tests of questionable wisdom. Water Rockets - made from 2-liter plastic soda bottles. Surprisingly powerful, sometimes frighteningly inaccurate. Gravity Switch - why it should not work for parachute ejection. Grinder tile - An alternative to the mortar and pestle. Good for powdering small amounts. Cloth Board - An excellent tool for manipulating warmed propellant, allowing it to be shaped easily and precisely. KnCalc11 - A little Visual Basic program I am writing to calculate Kn ratio progressions for uninhibited, outside-inhibited and Bates grains. Not quite finished. Source code available, in case you would like to finish it for me! Rocketry Links, a bunch of them! Warning: these pages are not intended for the humor-impaired. If you can't take a joke, stay away from me! Occasional silliness herein does NOT reflect nor condone a casual attitude toward safety, civility, or the law.